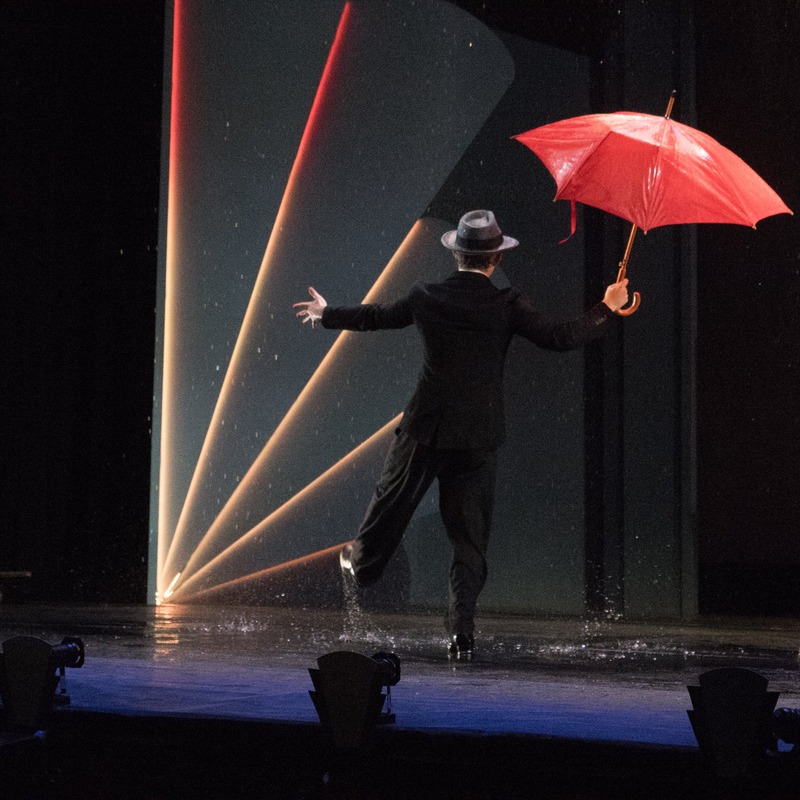 It is always a challenge to reinvent classics, and Singin’ in the Rain is no exception. The original film, starring Hollywood legends Gene Kelly & Debbie Reynolds was a 1950s hit, released in the same golden era as An American in Paris, The King and I, Funny Face and High Society. Curious Grin Productions’ show currently running at the Oxford Playhouse certainly has pizzazz in abundance, from the stunning flapper dress costumes that shimmy during the vibrant tap dancing numbers, to the real rain effect used during the iconic scene featuring the eponymous song. Set in 1920s Hollywood, Singin’ in the Rain follows the story of silent-screen celebrity and heartthrob Don Lockwood during the drastic period of change in the film industry, due to the introduction of “talkies”. James Hyde slipped into his role with ease as the smooth-talking Don, with a delightful nonchalance to boot. After serendipitously meeting a chorus girl, Kathy, whilst escaping adoring fans, there is an immediate chemistry between the two of them, despite her sneering disregard for film actors as opposed to respected stage actors. There was more than a hint of Debbie Reynolds (who played Kathy in the original) from Kathy Peacock. Her rendition of the feisty, up-and-coming actress Kathy Selden had a silver screen elegance to it and she demonstrated her charming vocal talents during “Would You”. Don has a potent animosity towards his leading lady, Lina Lamont, which results in some very amusing scenes and jeering insults, especially after Lina attempts to sabotage Kathy’s career out of sheer jealousy. Annabel Reed as Lina vivaciously portrayed the Prima Donna role, particularly shining during “What’s Wrong With Me”, after learning of Don’s deepening affection for Kathy. It’s definitely a positive that her shrieking voice is still ringing in my ears — I’ll be hearing her squawky New York accent for days to come! Her main challenge was bringing humour without caricature to the role, and she managed to give a controlled performance in this respect. As the bombastic director of the Lockwood and Lamont films, Matthew Carter had evidently spent time perfecting his flamboyant gesticulations and truly embodied the role of Roscoe Dexter. But it was Niall Docherty who truly stole the show as the energetic and cheeky Cosmo. In his role, timing is key and he never faltered in providing excellent comic relief. I was particularly impressed by the athleticism demonstrated during his main song “Make ‘Em Laugh”, which included many a slapstick moment and sofa-leap, whilst still giving a tenacious vocal performance. Donald O’Connor, who played Cosmo in the original film, stayed in bed for days after filming that scene, which is testament to Docherty’s stamina! The strong leading roles were supported by a fantastic ensemble. Although the eye-high leg-kick choreography was unrelenting and very challenging in parts, every single member of the cast incessantly and infectiously smiled through it all. Backstage, the production team provided a slick scene and furniture movement service for the actors under Stage Manager Jennifer Hurd and the band, led by Musical Director John Warner, coped admirably with cramped orchestra pit conditions and delivered a consistently rousing performance throughout. Naomi Omori’s direction was delightfully simple, without trying hard to make the production edgy. The script allowed inventive use of the onstage projector to show comedic pre-filmed scenes from The Duelling Cavalier and The Dancing Cavalier. By far the most impressive effect, though, was the downpour of rain that flooded the stage during the title song “Singin’ in the Rain”, turning the show into a four-dimensional, tangible experience for the audience. 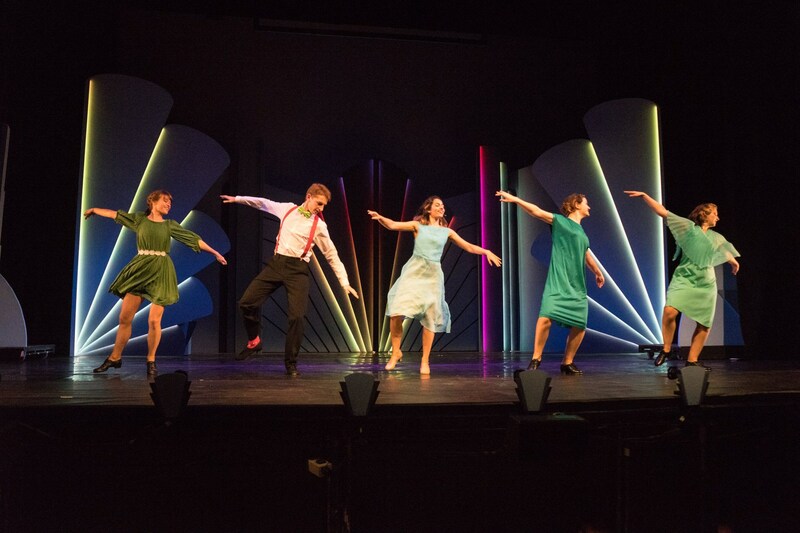 The minimalist art deco backdrop is strikingly juxtaposed with the vibrancy and exuberance of the production itself, allowing the audience to focus undistracted on each actor’s characterisation, which I’m sure will evolve during the forthcoming performances. This production is sure to send you prancing down Gloucester Street and leaping onto lamp posts on your way home, whilst dramatically declaring that you wish to purchase some tap shoes. All you need is some rain, which I’m sure October will happily provide. ‘Singin’ in the Rain’ runs at the Oxford Playhouse, Gloucester Street, until Saturday 31st October. To book tickets, please visit the Playhouse website.